April is here and it's the beginning of spring. I just love spring and all the warmer vibes that comes with it. So, I just want to share my thoughts on transition into spring. I just started buying some new outfits that are easy to transition into the new season. Dresses are my favorite transition outfit, as you can easily layer a cardigan or a denim jacket over it. Its just easy to pair a good boots or sandals to your dress. I am in love with my dress from Blooming Jelly, which is just perfect for this time of the year! This off-the-shoulder style keeps it warm, while the sleeves make it perfect when the weather gets cooler in the evenings. Spring colors like light pinks, yellows and other white shades are the way to go. This bohemian dress with some beautiful prints on my outfit are definitely spring approved. It has an asymmetric hi low hemline and a ruffle swing which is perfect for casual, date, party or any outdoor occasion. Not that you have to wear all light colors, but colors with lighter shade are perfect to start rotating into your everyday outfits. Blooming Jelly is a fast-growing Women's online clothing retailer, designed with elegance and simplicity. They have some lovely collection of casual and holiday personalized clothing for free and fashionable women. So, are you guys still in the winter mode or started thinking about spring wardrobe? Easter is around the corner and I want Kiara to get familiar with the easter egg hunt (She is just 17 Months Old and doesn't understand things much). So I am trying to get her involved into some Easter crafts and treats. She loves helping me with chores, so I thought it would be a great idea to get her to help me with decorating these Easter Cookie Nests. 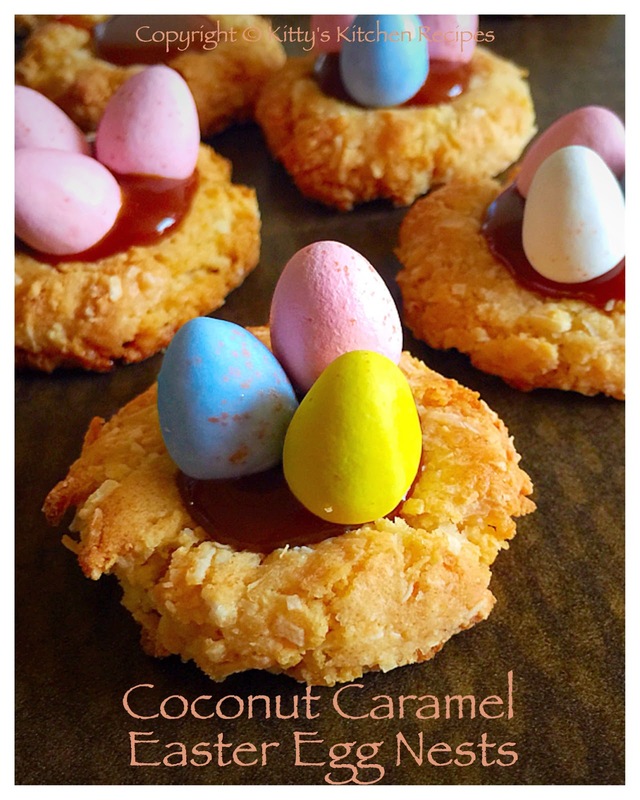 Coconut Caramel Easter Egg Nests are made with coconut cookies, salted caramel sauce and chocolate candy eggs. 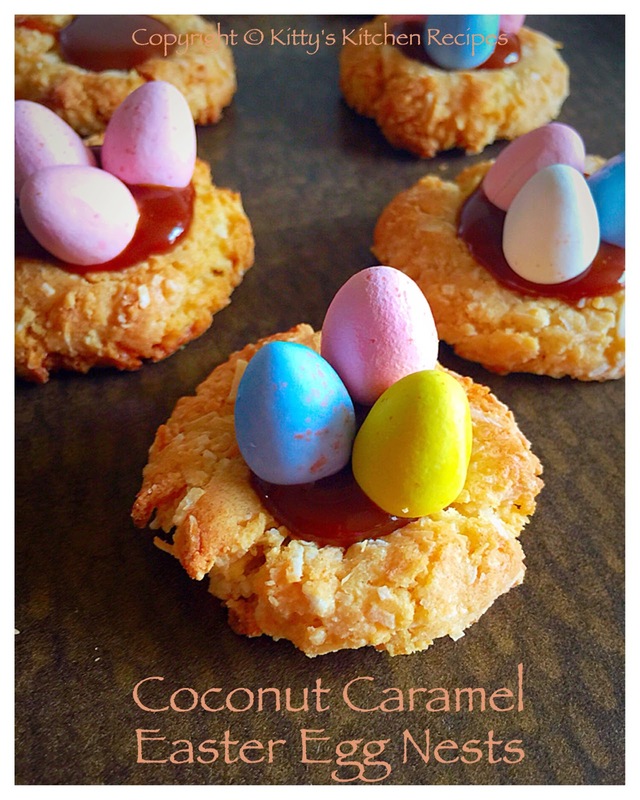 This is a cutest little Easter dessert ever. In a large bowl, combine blend coconut, sugar, flour, baking powder, almond extract andsalt. Add the condensed milk and fold it until just combined. 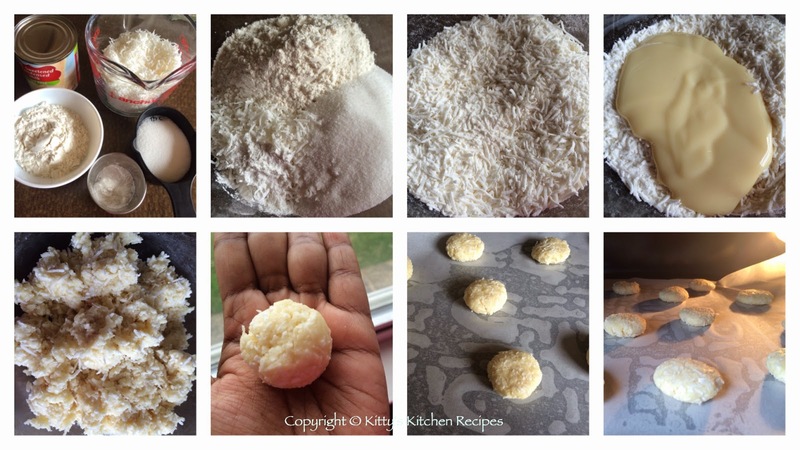 Roll spoonfulls of coconut mixture between palms to golf size balls cookies and then flatten into a disk. Arrange them on the baking sheet lined with parchment paper. 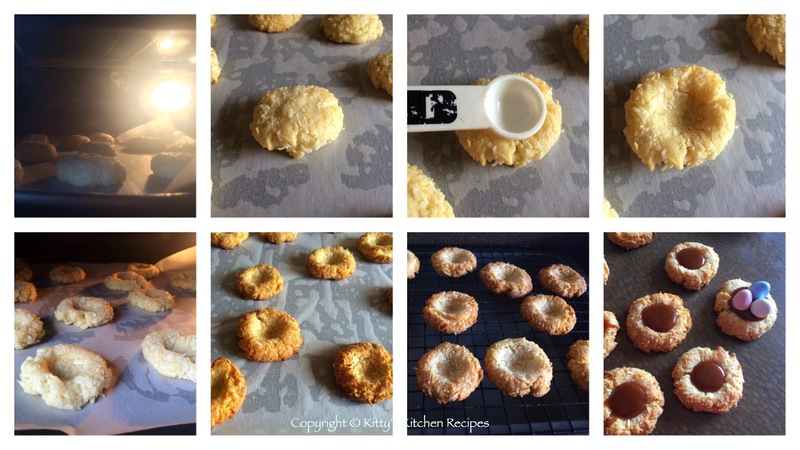 Bake cookies in the preheated oven for about 10 minutes, and then open the oven and take the cookies out. 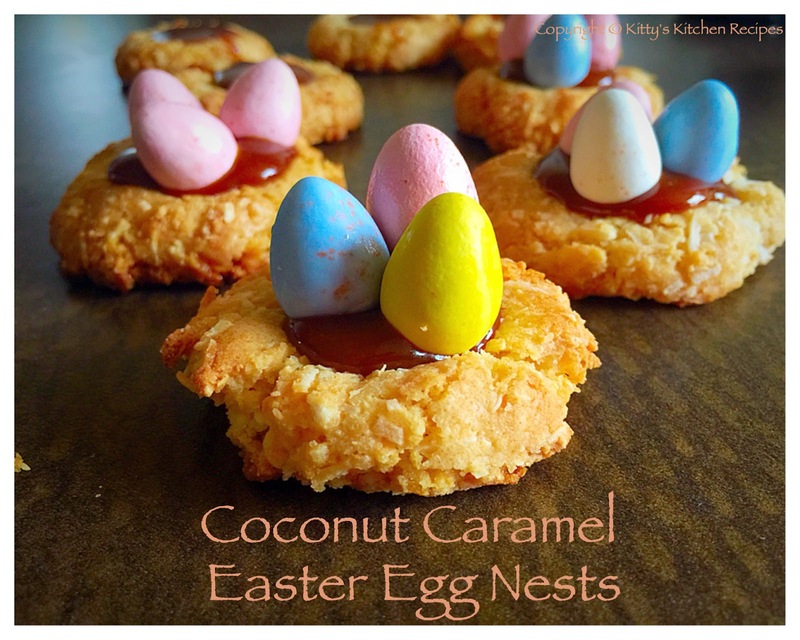 Use the back of a spoon to create a well in the cookie and reshape it into a nest. Continue cooking in the oven until the cookies is slightly golden and toasted, about 5-10 more minutes. Transfer to the wire rack to cool, about 30 minutes. Make some delicious salted caramel sauce. Fill each well with caramel sauce and fill with 3-4 candy coated chocolate eggs. Hey everyone, how's everything going on with you all. I've not been sleeping well lately and my under eyes aren't looking as bright as they usually are. Eye patches are my new thing, they work the best for dark circles and brightening my under eyes. They're really great because, you can wear them while you are working, watching TV, cooking and also wear it while you travel. I was going through my skincare stash and found this Hydrogel Eye Mask from BLAQ, which I got in my FabFitFun beauty subscription box, so I thought I would try it out and give my eyes a little pamper. These activated charcoal eye patches are Amazing when you feel your eyes are really puffy and need a bit of detox. These activated charcoal masks come in packs of 5. Each sachet contains 2 under eye masks in magic serum. Gently apply the mask about 1cm below each eye. Leave the mask to work its magic for about 10-15 min, before carefully peeling off the skin. Blaq says using the eye mask twice a week will help reduce the appearance of dark circles and under eye bags. But they can also be used as a one-off before an event or when you just want to feel good about yourself. The ingredient activated charcoal works to draw out toxins and impurities. And the Hyaluronic acid acts like a watering agent to moisturize and hydrate the skin under your eyes. It's a 100% cruelty free eye mask. I love that they stick really well to your face and my under eye area feels so much better after I have used these eye mask. The results were glowy and dewy. I felt refreshed and less self-conscious about my dark circles. I would definitely use it again, because it really does work. Deep down, we all know that sleep is the number one treatment for tired eyes and dark circles. There is no quick fix. But these eye masks would help when sleep is just not an option. Have you guys tried any under eye masks before? If yes, the how did you find them? You can buy a box of 5 masks for $29 on the BLAQ website here. Disclosure : I received this product in a beauty subscription box which I bought with my money. All the FabFitFun members get this item in their box. Formulated with charcoal and dead sea minerals, the luxe and gentle body scrub removes dirt for polished, hydrated and refreshed skin. All the FabFitFun members get this item in their box. This eye gel visibly reduce the look of under eye bags and dark circles with break through solution. All the FabFitFun members get this item in their box. This multi tasking leave in conditioner works all day to smooth, soften and detangled hair with moisturizing properties and enhanced heat protection. While reducing the plastic consumption, the sip by swell bottle can be filled with a hot or cold drink. The stainless steel water bottle is insulated to keep the drinks at just the rift temperature. All the FabFitFun members get the chance to choose between Show Me Your Mumu Brie Robe or Deux Lux Demi Backpack or Unplug Meditation Aromatherapy Diffuser. Turn your home into an Unplug Meditation Studio. Diffuse "Happy" while watching the diffuser change colors for ultimate zen experience. If you are a FabFitFun Member then you get to choose from a Tula Purifying Face Cleanser or Daily Concepts Daily Detox Brush or a Eleven By Venus Jump Rope. This is not an ordinary cleanser; it uses the power of probiotics to gently remove the dirt, impurities, makeup while leaving the skin balanced and clarified. All the FabFitFun members get the chance to choose between Quay Australia My Girl in Black/Smoke or Sunnylife Lovers Picnic Set in Malibu or Korres Wild Rose Vitamin C Brightening Sleeping Facial or Quay Australia Vivienne in Black/Smoke. I chose both the sun glasses just by paying a little extra. All the FabFitFun members get the chance to choose between Giadzy Copper Plated Measuring Spoons or Lavido Aromatic Body Lotion or A Mystery Item. I chose the mystery item so I received this Trestique Highlight & Perfect Multipurpose Stick. This box has a retail value of $314, depends on selection! I am pretty impressed with how many items FabFitFun delivers for just $49.99. I have no idea how they do it, but I love how much customization they are now offering to the subscribers. The best part is I love all the beauty options that annual members get to pick from! You can still get this box if you sign up today. So, what do you think about the FabFitFun Spring 2019 Box? And if you are already subscribed then what are the options you chose? Hello everyone, I have been meaning to write a parenthood update for a while, but having two kids around almost 24X7 makes things slow down a bit. Time flies and I really mean it. Jiyan is already 2 months old. I couldn't post his first month update as I was going through a busy start of new life with two kids. One who always wants you to play with the other one where you have to be with all the time. Jiyan's first month was the longest month of my life. 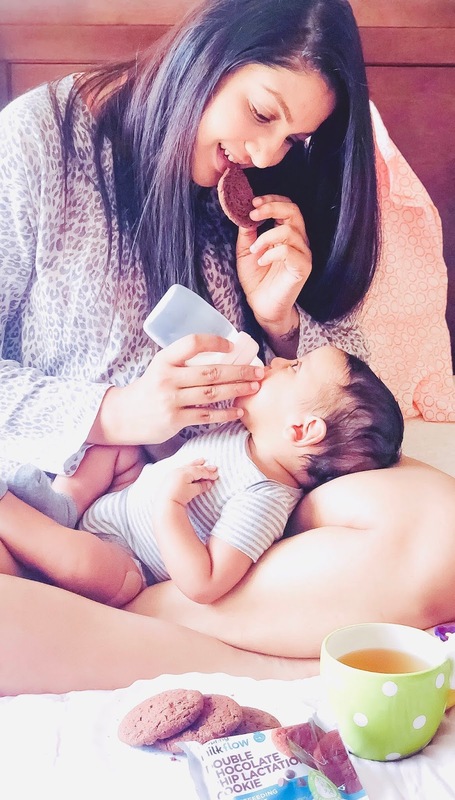 As I said bringing home a new baby where there is an active toddler is a hectic 24X7 run. I wanted to post more frequently on my blog but I never knew how the first month passed so quick. Jiyan used to smile a lot and blinked with his light brown eyes. He just wanted to be held all the time. His first few weeks were just crying, nursing and sleeping. The moment we feel the he is asleep and try to put him in the crib he gets cranky and starts crying. He didn't like to be put in the mamaroo. He never did any quite time until almost 3 weeks. Weight : He was 7 lbs, 15oz when he was born and dropped slightly to 6 lbs, 12 oz. Then he was back up once my milk started up on day 4. He was 9 lbs, 8oz that's on his first month doctors appointment. Diaper Size : Newborn until 4 weeks. We just started the size 1 from 5th week. Nicknames : Jiyan Bear, Jiu. Health : He's a bit snorty and it's normal according to the pediatrician. He smells lovely like a yummy baby. He is always hiccuping, very gurgly, cranky and cries. Sleep : He doesn't give hard time when it comes to sleeping. Night times are Super good as he wakes up once in 2 hours for nursing. The only time he acts up was from 5am to 6am then later he is all relaxed. Diet : I fed him almost 9-10 times a day and nurses around 30 min to 1 hr. Loves : Milk, being held on all the time & Dock A Tot sleep time. Milestones : He started recognizing my voice and turns in my direction when he hears me. He started staying more awake. He smiles at us and responds to us when we play with him. He gets his head up to see me while I put him on my chest or shoulder. Tries to push himself up while I carry him. And makes noises and responds to me while I play with him. Jiyan turned 2 months on 17th Feb. He just SMILES all the time and that's really PRECIOUS. He bonded with me since day 1 and responds to me with cute noises. You guys should see my Instagram stories to believe it. Jiyan started to co sleep with me and this made me get to know him a little more. This little one has been growing super fast. His newborn onesies barely fits him and 0-3 months are just perfect fit. He has been crying less and not being that fuzzy these days. He sleeps at night for longer stretches and I try to get some good sleep either. He is doing well with his morning sleep schedules. I am trying to get him used to 4Moms Mamaroo. He tries to be in there for max 20 minutes. Jiyan had his 2nd month check up last week, but he will be getting his vaccines this weekend. Diaper Size : We have been using size 1 diapers since his 5th week. Clothing Size : Mostly 0-3 months size. Health : He is active and spits up sometimes during the day. He had some super dry skin, so we have been using Mustela and it's getting better these days. Sleep : He is doing great with his day and night schedules. He sleeps for long stretches and wakes up only when he needs to nurse. Diet : He nurses an hour for every 2-3 hours. Baby Gear : 4Moms Carseat, 4Moms Mamaroo, 4Moms Bathtub and Dock-A-Tot. Loves : Making silly faces, tummy time, when we make him sit or let him stand straight up, talking. Dislikes : He doesn't like to be put down immediately after nursing. Milestones : He turned on his front by himself twice this week. He started recognizing my voice and turns in my direction when he hears me. He snapchats with me and smiles when I take videos of him. He pushes himself up on our chest trying to get his little head up. he does tummy time on our chest. 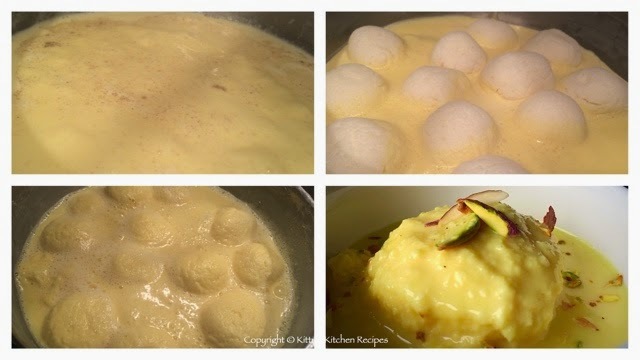 Rasmalai is a popular Bengali sweet made of rasgullas (spongy cottage cheese) soaked in thickened and sweetened milk. 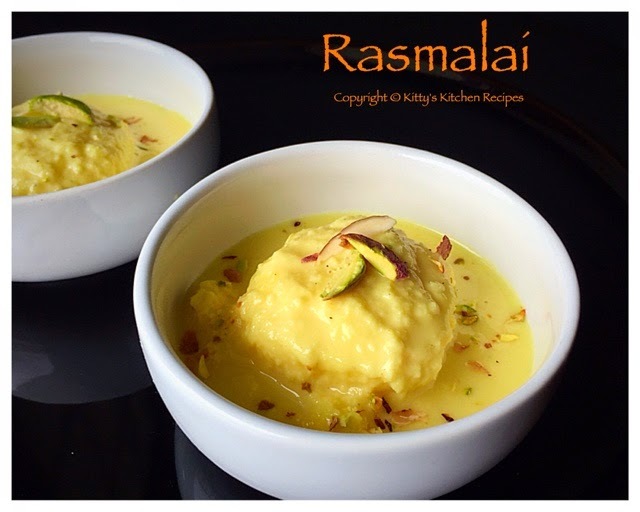 This recipe I am sharing is easy made with store bought rasgullas. Heat the milk and bring it to boil on medium flame. Meanwhile take each rasgulla and with a spatula apply pressure to squeeze the sugar syrup from it. Take 2 tbsp milk from the pan which is put on medium flame to boil into a small bowl. Then add 8 saffron stands to it, stir and set aside. Once the milk has come to boil, lower the flame and simmer the milk. Collect the cream floating on top with a spatula and bring it to sides. Continue to cook until the milk is reduced to half. This process of reducing milk will take around 25-30 minutes. Once it's reduced to half add sugar. Stir well until the sugar dissolves completely. Then add the saffron dissolved in milk. Also add the cardamom powder. Stir again and simmer for another 5-10 minutes. 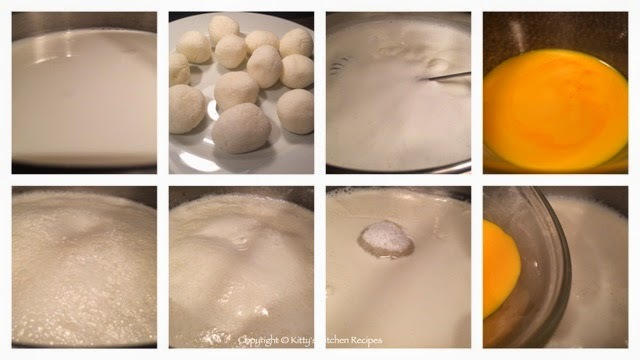 Now place the Rasgullas in the simmering milk. Again simmer for 4-5 minutes. 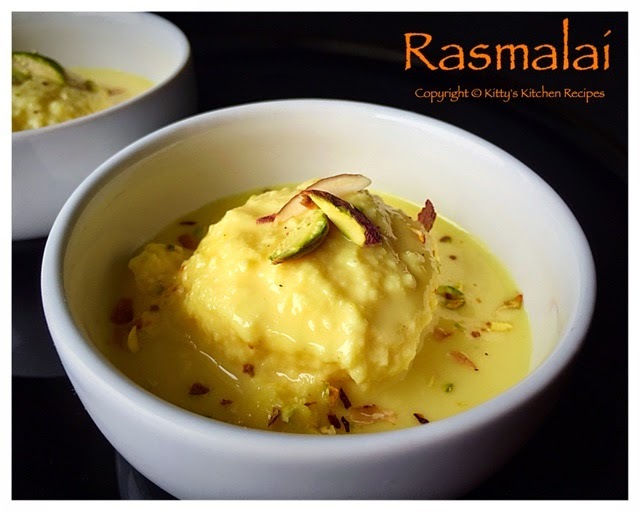 Switch off the flame and let the rasmalai come to room temperature. Then chill at least for an hour in the refrigerator. 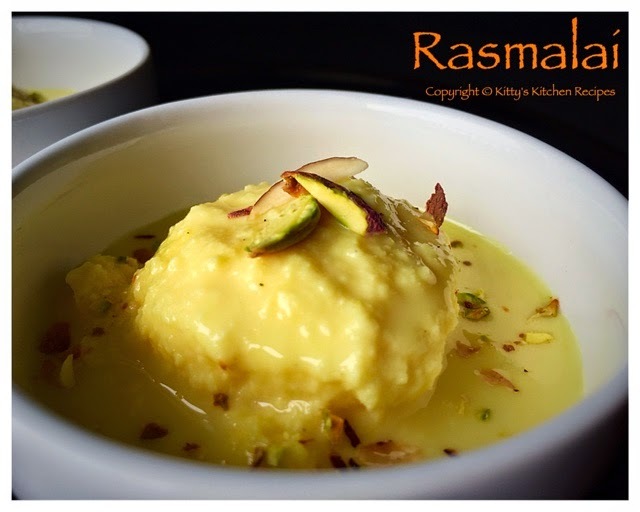 Serve rasmalai garnished with almonds and pistachios.